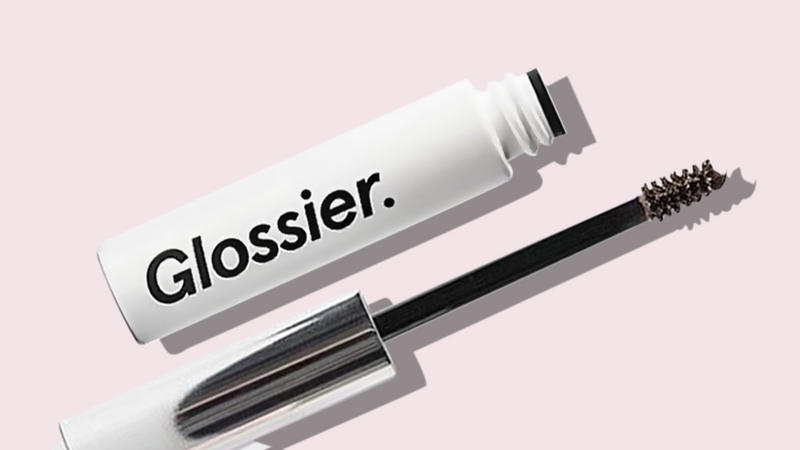 Today's post is a review / "worth the hype?" post about the palette that EVERYONE raves about. Im pretty sure you all heard about it and most of you love it. 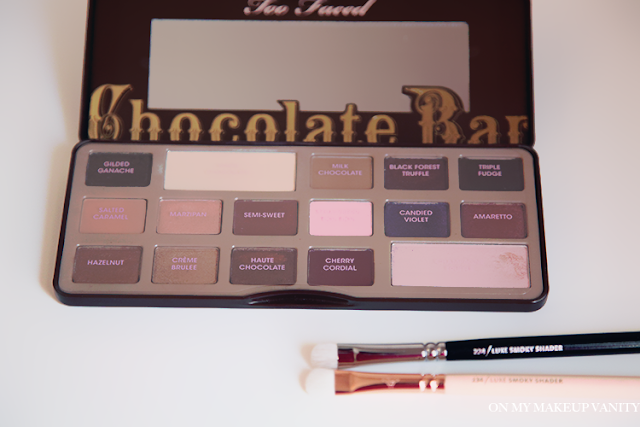 It is the Too Faced Chocolate Bar palette. To be completely fair and to give an honest review, I tried it more than once right before writing this post. My review was going to be mostly negative but I discovered some ways to use the shadows, which I will share with you. If you follow me on my Instagram, and read my posts, you will know that I LOVE warm and shimmery shadows, and I was not impressed with the ones in this palette. In my opinion you can easily find good matte shades, and I have, but good shimmery shadows and pretty shades at the same time? Nope, its rare. I LOVE the matte shadows in this palette especially Salted Caramel and Semi-Sweet! All the mate shades in the palette are great, actually. They are buttery, easy to blend and have decent pigmentation. However, the shimmery shades are somewhat disappointing. I find that some are dry, some look flat on the lids and the glitter in some shadows doesn't really transfer to the lid, leaving an almost matte-looking shadow. Also, with the glitter not transferring to the lids, they shadows can tend to look like a black/dark brown shade, like the glitter is what adds the color to the shadow in the pan. Before writing this post, I tested out the shimmery shadows with a different brush than what I usually use and I also tested them wet. I LOVED the result! The patchy dry shades like Gilded Ganache and Amaretto are no longer patchy and dry! The weird shades, from which the glitter falls off with blending, look beautiful when wet. The real color in the pan, sometimes even prettier, transfer to the eye when using a wet brush. The shade Black Forest Truffle for example, looks like a warm glittery shade in the pan, but when used wet, it is more of a maroon-ish brown which I love! The shade Amaretto turns into a very pretty copper with hints or orchid! The brush I used, wet and dry, is the Zoeva 234. The 2 in the photos below are the same, just from different collections. 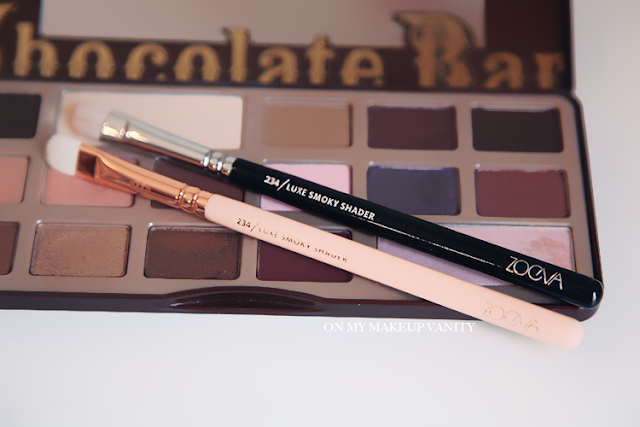 I usually use concealer brushes when using a shadow wet, but this works just as good. 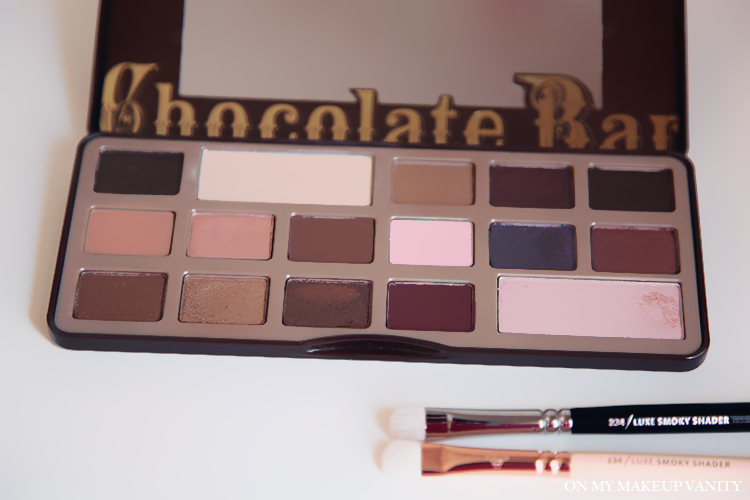 When its dry it give a good pigmentation but some shadows from the palette still look patchy. I also think that priming is so important when using this palette, to help the shadows go on as smooth as possible. So, after giving my review, the question Im trying to pose here is, are you willing to make that shadows work in any way possible or do you want a palette with shadows that are simply amazing and don't need a lot of effort? If you are willing to wet your brush every time you use a shimmery shadow from this platte then go for it, it will look amazing, trust me. But if you want something that is perfect just on its own, skip this. Let me know what you think of this palette. Do you love it? Do you hate it? Do you want to get it?